This is Lloyd’s stress reliever for the weekends. Actually the ’56 started as his daily driver and the shop car. One weekend some of his buddies dragged him to the local drag strip and he once again was back into the racing scene being absent since 1962. The car evolved over the years making it faster yet very reliable as a bracket racer. The latest version has a new small block Chevy built with all aftermarket parts and now sports 427ci. producing 650 HP and 545 lb/ft of torque on tap. The chassis firewall back, now has a complete 4130 cage, four link, adjustable coil over shocks and four wheel disc brakes. Traction is now made possible with Hoosier 14×32 slicks. Performance has improved in all areas, 60 ft-1.27sec to 1.30sec, best ET to date 9.42 sec @ 142 MPH. The eighth mile runs have been in the 5.95 sec at 114 MPH. 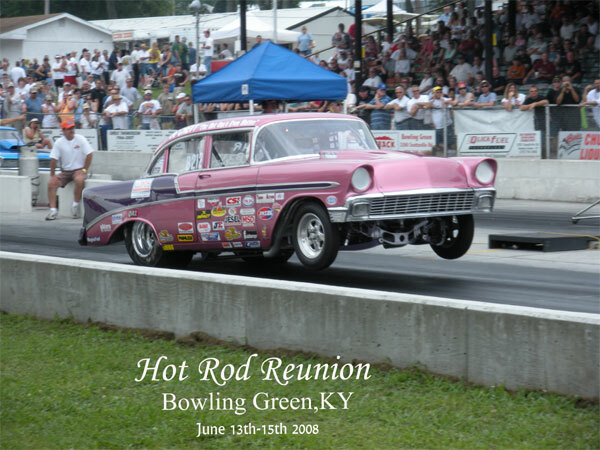 Dad and Mom have been racing the new ride at the NHRA Hot Rod Reunions at National Trail Raceway in Ohio and Bowling Green, KY. They do some Nostalgia events and a little bracket racing.